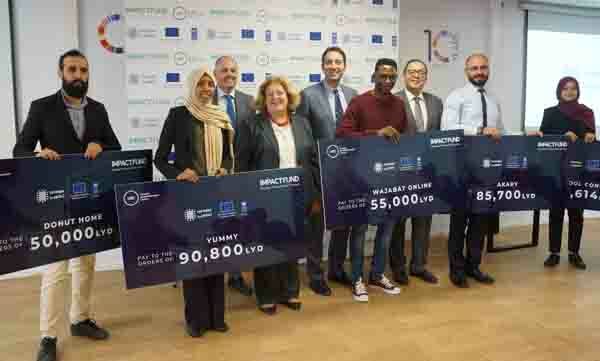 Six young Libyan men and women have jointly won a LD 400,000 entrepreneurial grant for their start-up projects (Photo: UNDP). Six young Libyan startups, two of them run by women, today won grants totalling LD 400,000 to support their projects. The grants were awarded by the European Union (EU), the United Nations Development Programme (UNDP) and Tatweer Research. The grants are part of the Impact Fund Programme, an initiative led by Tatweer Research and framed within the EU funded “Strengthening Local Capacities for Resilience and Recovery” project implemented by UNDP. A total of 109 Libyan entrepreneurs applied to the programme. The grantees, who come from different parts of the country, were selected based on the feasibility of their ideas. Their business ideas range from an App to order take away food prepared by Libyan housewives to a communication platform that connects parents and school administration. The grant ceremony was opened by Head of Delegation of the European Union to Libya, Alan BUGEJA, Deputy Special Representative of the UN Secretary General, UN Resident Coordinator, Humanitarian Coordinator and UNDP Resident Representative in Libya, Maria Ribeiro, UNDP Country Director, Sultan Hajiyev and CEO of Tatweer Research, Khaled Elmufti. Ambassador BUGEJA stated: “While the EU seeks to contribute towards returning stability to Libya, we cannot delay addressing the needs of young Libyans, the next generation of students, graduates, and professionals. On her part, Ribeiro declared: “I am glad to be part of this event. In the middle of all the challenges Libya is facing, I see it as a very important message to see youth working hard to improve the situation of their country. Khaled El Mufti, Tatweer Research CEO said: “Economic empowerment is critical to the future stability of Libya, in particular the role of the private sector. Libya has many challenges but our work over the last year has proven that there are many ambitious young Libyan men and women who are very entrepreneurial and very creative to work around the challenges in Libya, and to create new businesses. With the aim of supporting the local economy recovering, UNDP partnered with Tatweer Research, which with EU funds and through Impact Fund initiative is identifying and supporting plans that will create sustainable jobs outside of the public sector.